If you ask to any Italian about Milan, you’ll be told that it is such a grey city! No trees, no parks, just cars, concrete and blocks of flats. 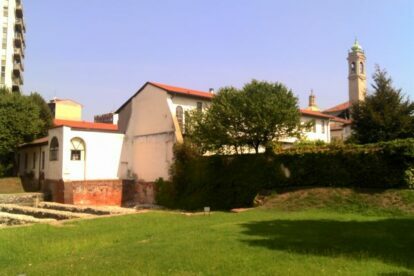 The fact is: there are lots of gardens and parks in Milan, but they are hidden and, normally, closed to public. Not always. Sometimes they are just hidden. No one goes there just because no one knows they exist. I’m not talking about tourists of course, I’m talking about locals. Isn’t it a shame? Well, let’s look at the bright side: once you finally get there, it won’t be crowded. So, if you are looking for peace and rest, head to the Parco Anfiteatro, the Roman amphitheatre park. 12.000 m2 of green fields in the middle of Milan, very peaceful (surprise!) and very well kept. It was opened about 10 years ago, after the end of the restoration of the archaeological ruins of this Roman amphitheatre that used to lodge up to 35.000 people before being destroyed in the 5th century A.D.
To get there you need to enter what looks like a private building with a big wooden door and some plaques on the wall (remember the street number, 17, otherwise you would not guess there is a park behind it), get in, continually go straight on till you arrive to a white inner court, take a right and you’ll be there, finally.